This lack of focus has somehow (unfortunately) caused me to gloss over the Bombardier CSeries family of commercial airplanes. Of course I have heard a lot about them over the years, but I always seemed to skip over the press releases and endless discussion about them on airline forums such as airliners.net in favor of more interesting topics. Hey – regional jets aren’t very exciting to me especially when other (more significant) aircraft such as the A380, 747-8i, and A350 have been launched during the same time period. 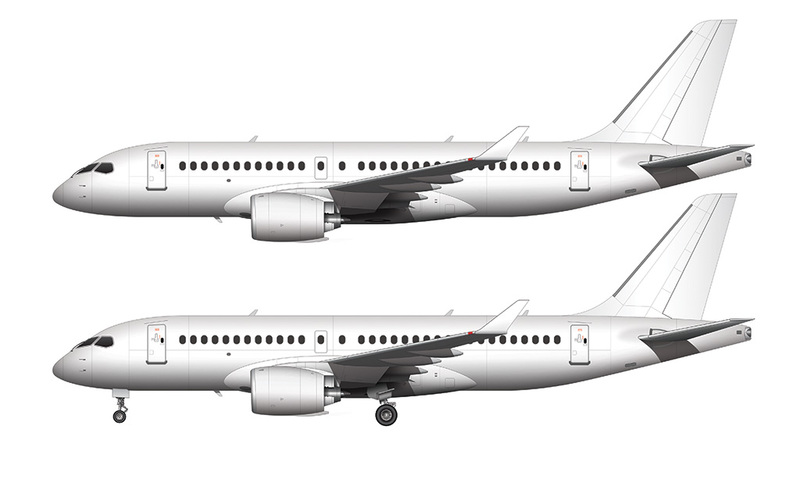 Now that I’ve completed a side view blank template of the CS100, I’m disappointed that I haven’t been paying closer attention. This is an amazing little airplane! It’s sleek and elegant with eerily similar proportions to the Boeing 787, and it makes the ERJ-175 with its tiny engines and stubby fuselage look downright goofy in comparison. I know that the CS100 and the ERJ-175 aren’t direct competitors, but they will likely end up flying the same type of routes. In that regard, it’s always interesting to see how two different manufacturers approach a single problem from their own perspective. Bombardier has certainly come a long way from the CRJ-200, and the CSeries looks to be light years ahead of that tiny little regional jet in terms of technology, passenger comfort, and design. 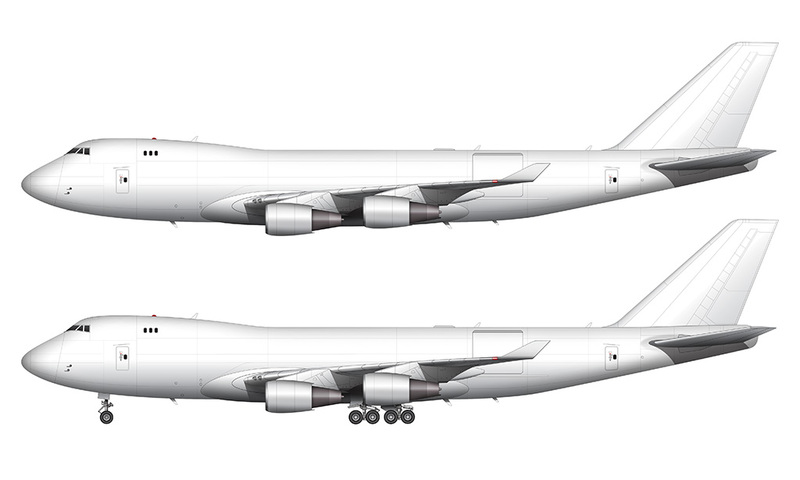 My fingers are crossed that they can win some major orders for this airplane – things are a bit sluggish at the moment, but I’d love to see large numbers of these things flying around during my travels. 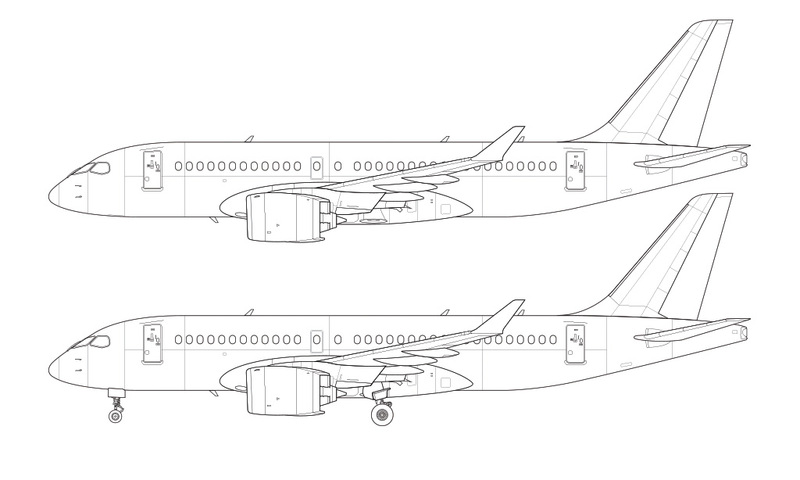 By the way, the CS100 is the baby of the CSeries family, and larger variants will be offered soon (beginning with the stretched -300 version, which I will upload a template for in the coming days). It’s massive engines and short fuselage make in an instant favorite of mine, for the same reasons why I like the A350-800 and 767-200 so much. Big engines on small airplanes always look great!